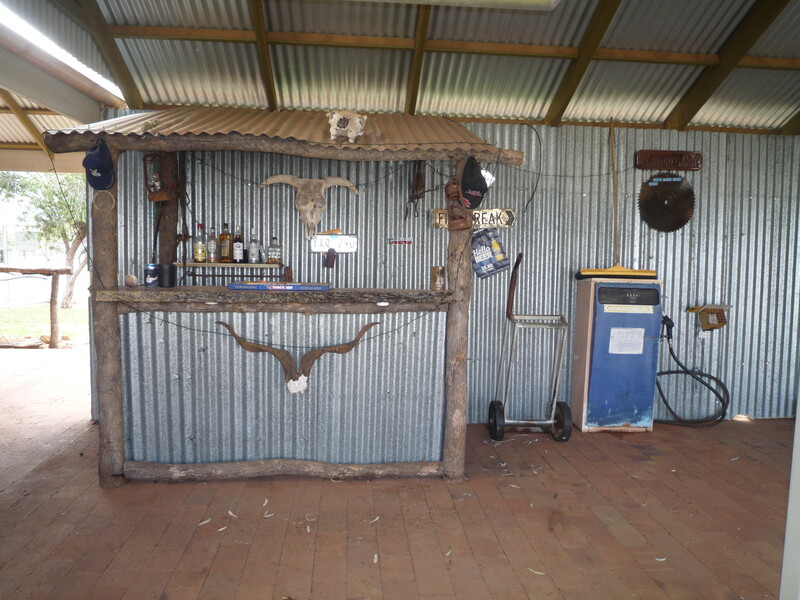 There are two police residences and as Jed arrived in May, he got first dibs and chose the residence with the bar (Yes, someone was obviously bored….. or alcoholic….. and installed a bar in the covered outdoor area complete with barbecue and fire pit. It’s nicknamed the Pigs’ Inn. Both residences are in quite good condition but there’s been talk that they may have asbestos and a couple of weeks ago, Jed received a call from UGL Services (which sounds rather like a British Soccer Team) to say that they’d scheduled time to fix the asbestos and would he move out to a B & B or other accommodation during the process? Considering there is no alternate accommodation for a man and a dog in Enngonia, the whole thing was placed in the too hard basket, obviously to be revisited when Enngonia becomes a thriving metropolis complete with motels and caravan parks. The only commercial property in town is the Oasis Hotel, which is a hop, skip and a jump up the road and where you can buy the best pub meals we’ve ever tasted https://www.facebook.com/Oasis-Hotel-Enngonia-187828863658/?fref=ts. They have 3 or 4 rooms that you can book if you want to stay the night (no pets) and apart from that, there’s no other accommodation in town. The mail (including our washing machine and 55” TV) is delivered by Miranda and Craig (how many people actually know their postman’s name?) by ute, on Wednesdays and Saturdays. Food and shopping is a mere 200 kms round trip to the IGA store where a full trolley will normally cost between $200 and $350. Woolworths, Coles and all things discount can be found at Dubbo, which is around 5 hours away but by the time you add up the petrol costs, it’s probably cheaper to shop in Bourke. 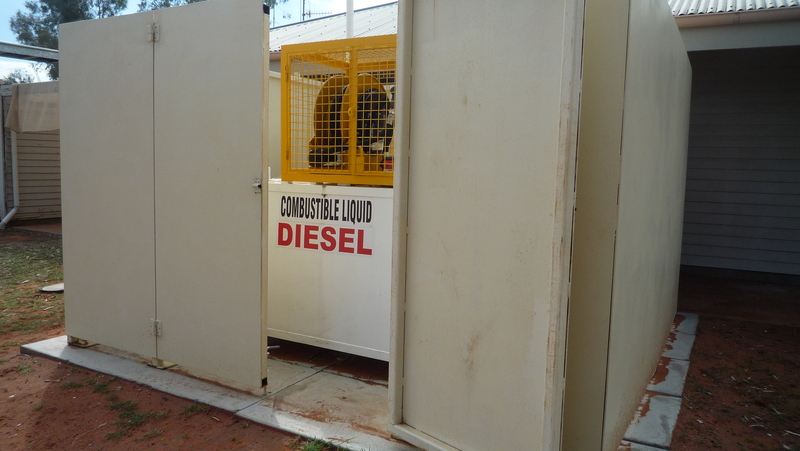 While the police station has its own diesel pump for the police truck, the closest petrol and gas is in Bourke and, remembering that’s 97 kilometres away, it pays to check the tank before heading back home after a shopping trip. There’s only one service station that sells LPG and it’s uncanny how many times we’ll go there to find that they’re closed for lunch. While Enngonia is one of the few police stations in NSW with its own diesel pump it also has the dubious reputation of being one of only two police stations in NSW that don’t have police radio (Wanaaring is the other station). So while other cops can call and ask for a ‘transport’ (rego check) Nigel and Jed have to write the rego number down and then go back to the station to ring Police Radio. The police station is air conditioned, which means that in summer it’s very tempting to move our bed into the station, rather than the back room. Remembering that evening temperatures can stay in the 50s, we’ve done well so far to resist that temptation. The Bourke Medical Centre has been very accommodating and has so far managed to fit me in at short notice and so too has the Radiology Department at the Bourke Hospital so there are no complaints there. The Towers Pharmacy in Bourke has a system where they keep your script and when you ring for it to be filled, they’ll send it out with the mail. There’s also a mobile dental service that comes to town every month but, remembering my experience at Ivanhoe where the dentist had to repair the equipment before using it, I’ve opted to visit the dentist at Cobar, which is about 2 ½ hours away. The eye specialist flies in to Bourke regularly from the Prince of Wales Hospital Eye Clinic and is driven to Enngonia by the CDEP (Community Development Employment Projects- a Government funded body overseeing projects for indigenous employment). Eye specialists have been providing eye care to Bourke ever since Fred Hollows started 4 decades ago. Apparently Fred was a regular at Enngonia and became so fond of the staff and students at the school that he invited them all to spend a weekend with him at his house in Sydney. Everyone speaks very highly of him. Enngonia is a lot smaller than Ivanhoe and I admit I was quite unprepared for the type of isolation where you can walk down the main street and not run into a single person. The population consists of Nigel, me, Jed, the publican and his wife (George and Kath), our neighbours Paula and Ron and Kath’s parents Lee and Ted, all of whom have become good friends. There’s also the relieving principal, Michelle and another full-time teacher, Faith who are both in their twenties. Principal’s positions in the outback are often filled by young casuals because no one else seems prepared to live there. The indigenous population live in the Clara Hart reserve just on the outskirts of town and I’ve found them to be friendly and supportive. Most of them are happy to send their kids to school and are keen for them to be well-educated. They’re also keen to maintain their culture so children go to school during the day and learn to hunt, kill, skin and cook after school and on weekends. Nigel would probably describe his job as quite laid back, compared to the city or the coast and in fact, a lot of his work is pro-active. But that’s not to say that he doesn’t get called out in the middle of the night to deal with alcohol-fuelled domestic and other disputes. However, all in all, he loves being a country cop and I suspect he’ll be a bit sadder than me when we finally say goodbye to remote policing. He’s currently studying for the Sergeant’s exam (one of many flaming hoops), so that I’ve picked up most of the regular chores including emptying and stoking the fireplace and tending the vegetable garden – which was a success of sorts last Summer (see photo) so we’re now attempting a winter crop. We’re also looking after Jed’s hens (the 3 Henriettas) and two sheep, (he named them Sunday and Roast but I feed them treats so they answer to my names for them – Harley and Rose) while he’s away. Winter means that we have finally returned to our bedroom and our comfy king bed. Bear and I were looking forward to the lack of snakes so that we might resume our long walks around the town, romping in the long grass and chasing emus (Bear, not me) but sadly, someone forgot to tell the snakes that it was past their bedtime and there are still sightings around town. To add to this dilemma, there are also small herds of rogue cattle roaming the Common (a freehold area surrounding the town) to contend with. Nigel and Jed are trying to sort out how to get them out of town and who is responsible but they’ve become very skittish at the sight of helicopters (the cattle – not Jed and Nigel) and they’re spread over such a wide area (think 120 head of cattle over 70, 000 acres) that there’s no immediately easy fix. While it’s debatable who owns and is responsible for them, it’s not debatable that they do belong to someone and so they can’t just be shot or sold…. Even if they could be caught. So that’s pretty much life in Enngonia. To reward ourselves for all the study and chores, we’re off to Paradise Beach for a week and then house-sitting for Mike and Tanya in Longueville. Then we’re back in town for the Enngonia Races (there may be no shops but the town has its own race course!) on the 13th of July. This is a story I can relate to. The Australian outback and it’s people are described perfectly. You must continue and tell us all your adventures. You are my favorite blogger who displays a unique style that is captivating.